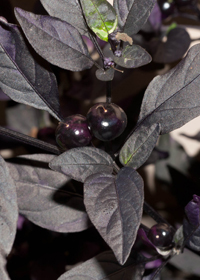 Dramatic deep purple-black leaves and even blacker, glossy peppers adorn this compact bushy plant. Peppers turns from black to glossy crimson when ripe and are extremely hot. A superb contrast for lighter leaved plants.